Here's a cute idea! Check out these School Joke Stickers for $4.99 (Retail $9.99). Bring back the nostalgia of the popsicle stick joke and make your kids smile every day with a funny, silly and yes, sometimes corny joke! 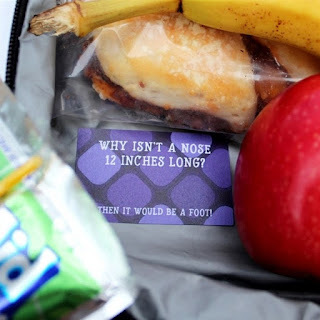 Simply stick a joke on your child's lunchbox, sandwich bag, juice box, banana, etc. Our kids love these and look forward to a new joke every day to smile and tell their friends. A fun new tradition for kids of all ages.